A drink once known only to Viking reenactors and fans of Old English poetry, mead's popularity is growing. 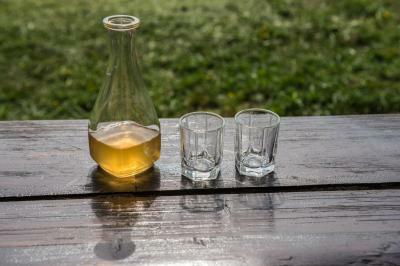 The alcoholic beverage, which is made by fermenting honey with either wine or beer yeast in water, can showcase a broad range of flavors depending on the type of honey used and any fruit, spice, herbal, or botanical components that may be added. Since opening its doors in April of 2018, IronStone Meadery has made 1,200 gallons of mead, used 4,500 pounds of honey, and is already preparing to expand in its Greene Township location. The business is the culmination of a dream shared by Rich and Diana Konkol and Brian and Kelly Murray. The two couples have been friends for more than 10 years and both men were hobby brewers and manual laborers. As they grew older, injuries and the wear and tear of their jobs began to take a toll. Rich worked as a welder and blacksmith, while Brian was a DJ, construction worker, truck driver, and furniture mover. "People liked the homebrew so much, we started talking about doing it on a commercial scale," Rich said. "It was a pipe dream for eight or nine years, but then we started to look into it more seriously." The name, IronStone, is a combination of the Konkols' Iron Willow Farm and Murray's Stone Mountain Construction. The four have also combined to share responsibilities for the business. Brian focuses on brewing, procuring insurance and permits, and purchasing ingredients and supplies. Rich is also a brewer and handles social media and public relations. Kelly, an accountant, takes care of most of the paperwork, including licensing and accounting and also runs the website. She is also responsible for many of the unique names of the different flavors and creates the custom labels. Diana is in charge of the tasting room, which includes sales and stocking product. She also decorates the space with her own pottery and paintings, which are for sale to customers. In the past, Diana has worked as a welder and a veterinary technician. IronStone buys its honey primarily from Dutch Gold, a honey distributor in Lancaster, Pa., that gets honey from all over North and South America. "We use six or seven varieties," Brian said, "including buckwheat and Tupelo." Tupelo honey is the sweetest and most expensive flavor of honey and is prized by mead makers. "We got it cheap because of Hurricane Michael last year," Brian said. The storm severely damaged a warehouse in North Carolina, so the company needed to sell the honey as quickly as possible. Brian brewed his first batch of mead 12 years ago after attending a weekend workshop, led by George Lee, at Rich's farm. Lee, who passed away several years ago, was well-respected among local brewers and gave many mead makers their start. Brian remembers his first batch was too dry. "New brewers either use too much or not enough honey because they go for high alcohol content." Mead-making is both an art and a science. The brewer is looking for a high alcohol content along with a good flavor. "It takes two months to 10 years to make a batch, depending on what you're doing," Brian said. IronStone is currently brewing a port mead that will have a 22 percent alcohol level by volume when it is done. This variety will take 10 years to complete. 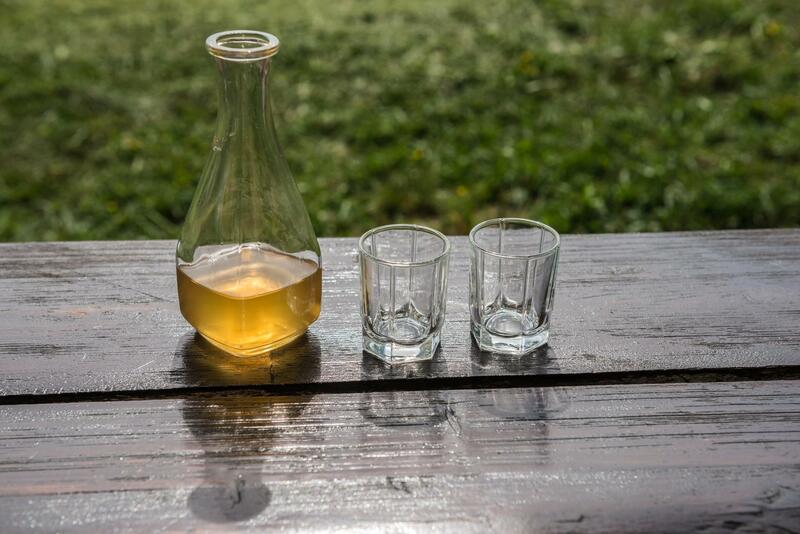 It takes about six to 12 months to produce a mid-grade mead, which will have an alcohol level anywhere from eight to 14 percent. The ratio of honey to water determines how high the alcohol percentage will be in the final product. "We keep it over eight percent," Brian said. "If it is under seven, we need a nutrition label, which we would rather avoid." IronStone's license is for a limited winery. They are allowed to make under 2,000 gallons per year. Sanitation is the most important part of the mead-making process. After all of the equipment is spotlessly clean, honey and water are mixed together with yeast in a 75-gallon plastic tank. This process--called primary fermentation--takes about two weeks. Then the batch is degassed, which involves stirring it vigorously to remove carbon dioxide. The liquid then sits in the tank for a couple of more weeks until the specific gravity is reduced. At this point, it is transferred to a secondary vessel in a process called racking, which removes some of the spent yeast and clarifies the batch. Brian uses stainless steel, variable capacity tanks for secondary fermentation. "We measure the specific gravity and alcohol content, but mostly we go by taste." The mixture spends four to six weeks in the second tank before it is filtered to remove sediment. Then the mead is bottled, corked, shrink-wrapped, and labeled. Brian adds fruit and spices at the beginning of the process and then adjusts throughout the process. Rich starts with a traditional plain mead mixture of honey, water, and yeast then adds flavorings later. There is a bit of friendly competition between the two brewers, and they are planning to let customers decide which process they prefer. Right now, IronStone is offering two buckwheat meads, "Bucking Wheat," made by Rich, with an alcohol content of 8.8 percent, and "Buck You" at 16.8 percent, made by Brian. The two are also planning a competition when their next batches of traditional mead are ready. "The loser must wear something really annoying, perhaps a pink, fluffy bunny costume ala A Christmas Story," Brian said. The proprietors of IronStone Meadery definitely have a sense of humor and this is most evident in the names they give their varieties. Screw Your Passion started as a major screw-up that they fixed by adding passion fruit mash to the batch. Other names refer to the length of time it takes to brew a batch, such as A Quicky; or to the ingredients, for example, Bloody Berry (black currant and strawberry), Clov'N Moon (cinnamon and cloves), The Strawman (strawberry and cherry), and Pop Your Cherry, (buckwheat honey and cherries). "We skirt a fine innuendo line," said Rich. They also have several flavors with names that refer to role-playing games, such as Level 1 Bandit and Level 2 Samurai because many of their customers are gamers. "We only take our mead-making seriously," Brian added. "If you can't laugh about something, come see us. You'll leave laughing." IronStone Meadery hosts special themed events when they bring out a new flavor. The theme parties feature local food trucks, such as Boom Boom Pow, Give a Crepe La CrepErie, and Waffle Miracle. They are also working on an event to be held at the same time as Roar on the Shore, which will be called Whisper in the Country and feature music, local food trucks, and bonfires. "I'd rather see local businesses work together and people come up and have fun," Rich said. To that end, IronStone Meadery is already planning to expand. They are waiting for permits and bonding to come through, and then they will be cutting a door in the wall between their current brewing area into another classroom in the former elementary school where they are located. The new space will be used to expand production and storage, as well as create a dedicated science lab for testing. They also plan to increase the size of the tasting room. "We hope to go up to 4,000 gallons," Brian said, "and eventually distribute to restaurants, craft breweries, and wineries, but in order to do that we need a product that is shelf-stable for one to two years." Plans beyond the expansion include a future mead hall, which would be a Viking-style longhouse with a restaurant and possibly a bed-and-breakfast attached. "We want to become a destination spot," Brian added. The plan is to host weddings and banquets and offer a Viking menu with costumed entertainment along the lines of Medieval Times, except set in the Viking era. IronStone Meadery is located at 9333 Tate Road, Erie, Pennsylvania and is open Thursdays from 4 - 9 p.m. and Fridays and Saturdays from 1 - 9 p.m. They can be reached at (814) 616-0086 or at ironstonemeadery.com.